Director – Gil Kenan, Screenplay – Dan Harmon, Pamela Pettler & Rob Schrab, Story – Dan Harmon & Rob Schrab, Producers – Jack Rapke & Steve Starkey, Photography – Paul C. Babin & Zavier Perez Grobet, Music – Douglas Pipes, Visual Effects Supervisor – Jay Redd, Visual Effects – Sony Pictures Imageworks (Supervisor – Troy Saliba), Production Design – Ed Verreaux. Production Company – ImageMovers/Amblin Entertainment/Columbia/Relativity Media/GH One LLC. Fifteen year-old DJ lives opposite the house of the cranky Mr Nebbercracker who terrorises any children that step onto his property and takes any toys that fall there. When DJ’s best friend Chowder loses his ball on Nebbercracker’s lawn, DJ bravely ventures forth to get it, only for an angry Nebbercracker to emerge from the house. In the struggle for the ball, Mr Nebbercracker collapses from a heart-attack. Afterwards, DJ is left at home with a babysitter while his parents go away. He and Chowder then think they see Mr Nebbercracker’s house moving of its own accord. As they watch, everyone who ventures onto the property – from dogs to the babysitter’s boyfriend and investigating police – are snatched up and devoured by the house. DJ believes that Mr Nebbercracker has died and the house has become possessed by his spirit. Joined by Jenny, a girl they save from being devoured, DJ and Chowder attempt to venture into the monster house and extinguish its heart. Monster House is an animated film that comes sponsored by some impressive names – Robert Zemeckis and Steven Spielberg and either’s production company, respectively ImageMovers and Spielberg’s pre-DreamWorks company Amblin Entertainment. The film was made in the performance capture process that Robert Zemeckis used so impressively on The Polar Express (2004) and the later likes of Beowulf (2007), A Christmas Carol (2009) and the Zemeckis-produced Mars Needs Moms (2011), wherein performances were first filmed in live-action and then animation rotoscoped (or traced) over the live-action footage. In a year (2006) when the holiday season seems overrun by a glut of virtually identical CGI talking animals films – The Ant Bully (2006), Barnyard (2006), Flushed Away (2006), Happy Feet (2006), Open Season (2006), Over the Hedge (2006) and The Wild (2006) – Monster House proved a refreshing delight that stood out above the rest of the crowd. 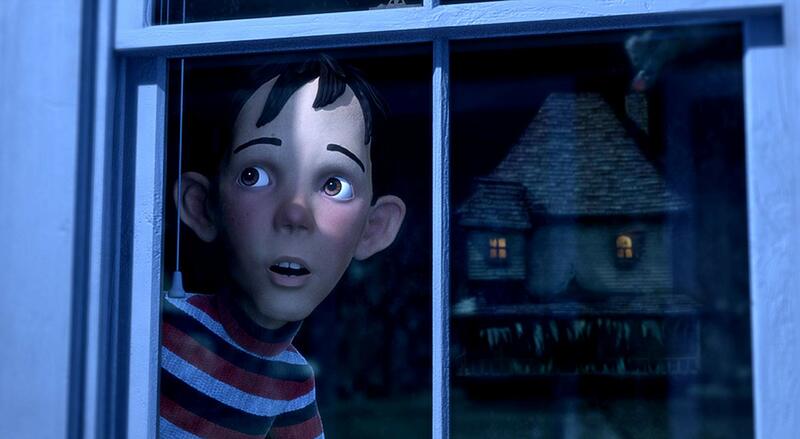 While most of these other films seemed determined to irritate with cutsie talking animals doing pop culture gags and mimicking songs or fall into over-used clichés, Monster House by comparison comes across as warm, original and quite delightful. Monster House was made by debuting director Gil Kenan. In Kenan’s hands, the action comes with a wonderful cinematic flourish. His animated camera has an amazing fluidity and the ability to move through a scene into perfectly framed emotional poignance – something that comes with far greater dramatic effect than many live-action films. There is a marvellous climax with the three characters fighting the ambulatory house and taking it on with a crane, where Gil Kenan’s camera leaps into all manner of swoops and dives. In tone, Monster House falls somewhere between the comic grotesque of a Tim Burton film like Beetlejuice (1988) or The Nightmare Before Christmas (1993) and the children’s adventure of something like the Spielberg-produced The Goonies (1985) or Stand By Me (1986) – indeed you would almost swear that the character of Chowder was copied from Jerry O’Connell’s Vern in the latter. The film is appealingly well written, even decidedly adult in its sense of humour at times – one wonders how lines like “This must be the uvula”, “You mean it’s a girl house?” – managed to get past the US censor. Although being a family film, Monster House cannot go as far as killing characters off and the end coda brings everybody devoured by the house back to life. Perhaps the greatest delight about Monster House is the characters who come with a genuine charm and are nowhere near the easy comic relief characters that usually appear in animated family movies. These range from the babysitter (voiced by Maggie Gyllenhaal) with a bored slacker attitude, blackmailing the hero the moment his parents are out the door; the girl scout with snappy capitalistic sensibilities who turns up on the doorstep ready to cut a deal for candy with Maggie Gyllenhaal’s babysitter; the fat kid and his hilariously geekish enthusiasms, especially the scene where he tries to act suave and charming in front of Jenny; the overenthusiastic rookie cop who models his beat cop policing on action movie poses; Nebbercracker who has an uncanny resemblance to Gollum in The Lord of the Rings; and the videogame geek, voiced by no less than Jon Heder of Napoleon Dynamite (2004) fame. The filmmakers have made great effort to create three-dimensional characters that have a refreshing modern cynicism and a great likeability in their foibles. One of the considerable surprises about the film is also its reversal of sympathies for the character that it initially depicts as the villain. Director Gil Kenan subsequently went onto make the muchly underrated live-action fantasy film City of Ember (2008) and the remake of Poltergeist (2015). Screenwriter Dan Harmon later went on to create the tv series Community (2009-15) and the animated Rick and Morty (2013– ).